The Florence Nature Preserve may be easy to overlook among the stately granite cliffs of Hickory Nut Gorge near Gerton, but this lovely wedge of forest shouldn’t be missed. 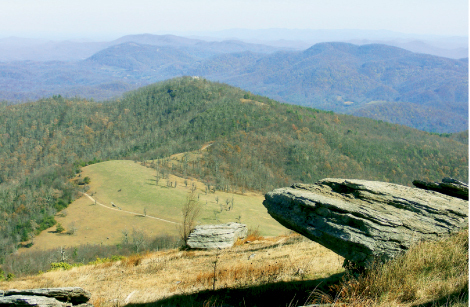 The 600-acre preserve is the legacy of Glenna and Tom Florence who deeded the property to the Carolina Mountain Land Conservancy. Here, there are lofty payoffs for nature lovers. The five-mile trail network is ideal for a short stroll or day-long exploration to see gushing streams, hardwoods, and wildflowers on the flanks of Little Pisgah Mountain. From the parking area along U.S. 74A, the yellow blazed trail climbs a series of switchbacks with sections of sturdy locust steps. Pass a bygone log structure along the way, and at 0.7 miles, follow the blue blaze trail upstream. In less than a mile, turn right on the orange blaze trail at a grassy fork. The trail contours through a tranquil cove and dead ends in a quarter mile on a rocky knoll with a view of the gorge. Backtrack, or continue uphill on the blue blaze and left on the red trail, reconnecting with the blue blaze via the white spur trail.